Then you invite everyone you want and you go horse back riding first then play gymkhana. Then you get to wash the horse(s) and learn about all the parts, tack, etc. Then while waiting for the horse to dry you eat cake and presents. Then you go and paint the horses for a competition. Note from Sydney: I've heard these washable non-toxic paints are good for painting horses. 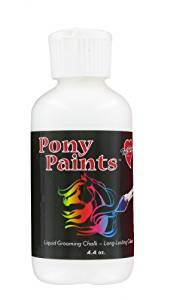 Be sure to use safe paints only on your horse or pony! Comments for Paint A Horse Party! !